Women''s cricket match played at Read Park last Saturday. The big news this week from the Tewantin-Noosa Cricket Club is that both the First Grade and the Fourth Grade teams will be playing next Sunday, February 10, in the Sunshine Coast Cricket Association One-day Finals. The Firsts will be playing their long-time adversaries, Caboolture Snakes at their ground in a 50 overs match. The Fourths will travel to Palmwoods to play their 40 over final. Both matches will commence at 10.30am and it is hoped that many supporters will travel to either Caboolture or Palmwoods to support the boys. Last Saturday the formats of the fixture matches changed to two-day games and all four teams are in positions to gain points. FIRSTS travelled to Glasshouse who won the toss and decided to bat first. As has been the tradition this season, the TNT spearheads did not disappoint reducing the Glasshouse Rangers to 4-22 in the first hour. It was absolute class bowling with the new ball from Scott Aufderheide and Tom Freshwater. Glasshouse dug in and played cautiously to go to lunch at 4-60 off 30 overs. Once the ball softened it was a harder slog for the bowlers but after lunch more wickets fell and Glasshouse were in trouble at 8 for 104. However, the long day became longer as their late order put up a fight taking their score to 190 when Scott Aufderheide claimed his 6th wicket. One of their middle order batsmen remained not out on 84. Scott ended with 6 for 55 off 21 overs taking his season tally to 36 wickets. 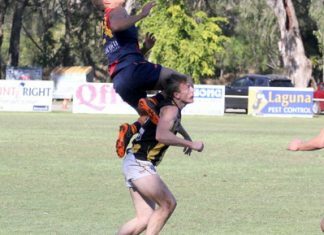 He was well supported by Freshwater who took 2 and Jarrod Officer and Cody Rzeszkowlski, one each. TNT had 17 overs to bat which was going to be a tough task in the fading light. Two wickets fell early before teenager, Sam Baker and captain Jake Dennien consolidated the innings to remain undefeated at stumps. Both looked very assured against the new ball as they finished the day at 2-23. Next Saturday the pair will need to build on their start and with TNT’s inform batsmen to follow, the team should gain first innings points. SECONDS. Playing at home against the Caloundra Swans, the TNT team were able to bowl out the visitors for 138. Best of the bowlers were Harrison Lea 3-23, Robbie Payton 3-32, Tom Stewart 2-22 and Blake Steel 2-16. TNT started their innings well but then wickets were lost to be 2-59 then struggling to be 4-84. Unfortunately, it was a too familiar story with TNT losing their last 6 wickets for 35 runs, falling 20 short of the target. The highlight for TNT was a great fighting knock by Tristan Griffin of 70, finding his form late in the season against a good bowling attack. Next week the challenge is to bowl Caloundra out early and then score the runs required for an outright win. THIRDS: The team were at Dale Officer Oval last Saturday playing against Yandina who batted first. All the TNT bowlers contributed well and were able to hold the strong batting line up to a score of all out for 162. Bowling figures- Jason Toohey 4-52, Kent Officer playing injured took 2-19, Bob McGhee 2- 39 and Cody Wright and Steve Sinclair picked up a wicket each. At stumps TNT were 1 for 87 well on the way to take a first innings lead with Steve Gallagher smashing a quick 54 and Brendan Wright 32. FOURTHS: Playing away at Palmwoods the TNT boys were sent into bat but lost early wickets to be 3-48 at drinks. Tony Watson was again the rock of the team and carried his bat throughout the innings to be 72 not out. He was supported by Justin Talbot who hit a quick fire 50 and later Matt Mayo with 15. The team were eventually bowled out for 162. Palmwoods started confidently with a steady flow of boundaries before Justin Latimer struck to take the first wicket, caught behind and the second in his 5th over to have them 2-57 off 10. Wayne Moore shattered some of their confidence with an awesome opening over, clean bowling two of their batsmen. 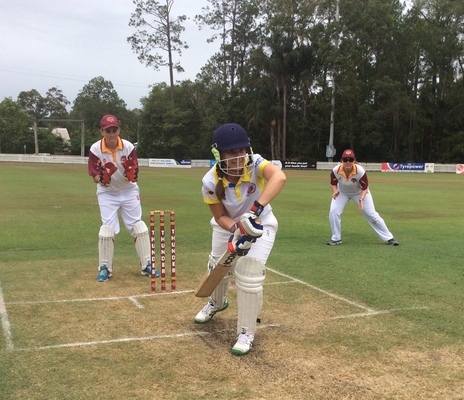 At stumps on Day 1 Palmwoods were 6 down for 108, still 54 runs behind TNT. Next weekend will be a big one for the club with all four matches resuming next Saturday, then the two finals on the Sunday.